He's one of the seminal figures in California music and a global ambassador for the folk-blues-country amalgam known as roots rock. 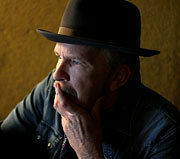 Join us as we welcome GRAMMY Award-winning artist Dave Alvin to the Clive Davis Theater for an intimate discussion and performance. Moderated by MusiCares Vice President Scott Goldman, Alvin will discuss his work as a band member of The Blasters, X, and The Knitters, his influential songwriting and guitar work and the creation of his latest album, Eleven Eleven (Yep Roc Records). According to Alvin, Eleven Eleven was the first record he's ever written entirely on the road and all of the songs are about "life, love, death, loss, money, justice, labor, faith, doubt, family and friendship. The usual stuff." After the interview, Alvin will take questions from the audience and perform a selection of songs.